We were rocked gently to sleep in a pure silk hammock suspended from the ceiling of a bamboo yoga bale, listening to the lull of the wind, the sounds of the river gushing, and birds chirping. 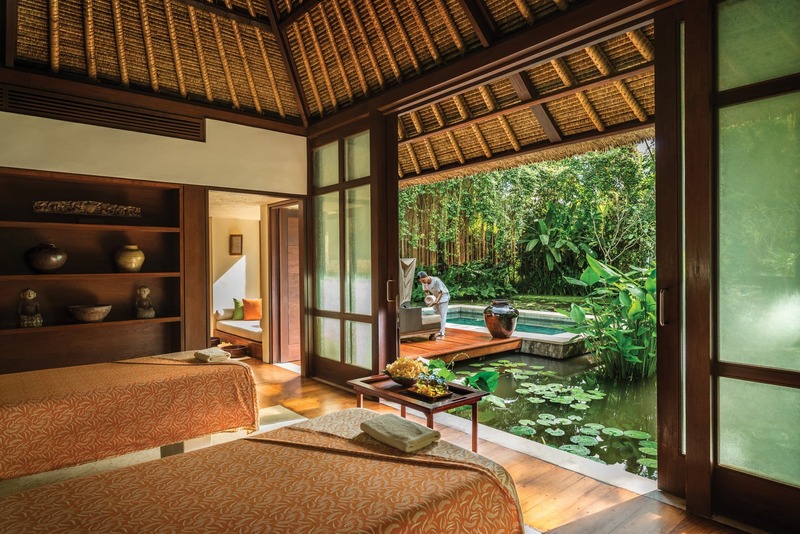 There we were, cocooned in the tranquillity of the Sayan Valley at the Dharma Shanti Bale of Four Seasons Resort Bali at Sayan. After a hectic week, we could finally relax as our itinerary for the day includes a scheduled “Sacred Nap”, said to bring about deep relaxation, boost immunity, and maintain healthy blood pressure, heart and brain circulation. The nap was created by resident wellness mentor Ibu Fera, who was inspired when she rocking her own baby to sleep. “Most of us have forgotten how good and nurtured it feels to be rocked to sleep and have somebody read you a bed-time story or sing a lullaby. I combine this with telling the life story of Buddha and chanting various mantras that I learned during my time as a Buddhist nun. The soothing sound of the singing bowl offers more sacred energy for this experience,” said Ibu Fera. The former Buddhist nun studied the Dharma in monasteries across Asia for seven years before becoming the wellness mentor for Four Seasons. “I combined the technique most Balinese mothers use to rock their babies to sleep — using a batik sling, singing traditional lullabies, and telling a story until the baby falls asleep — with my experience as a Buddhist monk to create the Sacred Nap. I substitute the lullaby with a sacred mantra, which can hopefully bring good vibration to bodily cells and to anyone who listens to it,” she added. Ubud is known as Bali’s spiritual heart. While Ubud Centre is characterised by temples that come to life at the golden hour, small boutiques filled with handmade dream catchers, and unassuming entrances that lead you to quaint riverside cafes, the area’s true magic lies away from the centre. Some of the region’s best attractions, from the Tirta Empul Temple to the Tegalalang rice fields, are a short drive away from the main area of Ubud; yet takes you closer to the heart and soul of Bali. One place that will remain with us far after we leave Ubud is the lush Sayan Valley. The valley is exactly what you’d imagine Ubud to be from its depictions in Elizabeth Gilbert’s popular book Eat Pray Love, which catapulted the Balinese region to international fame when it was first published in 2006. 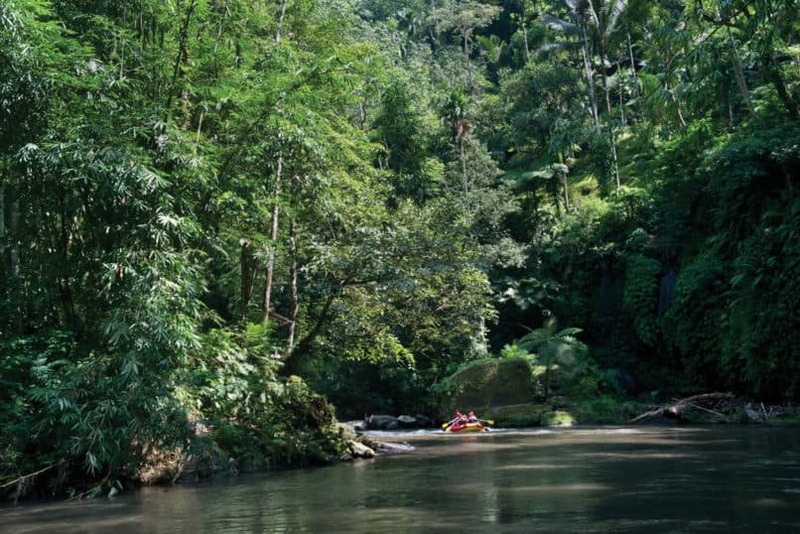 Here, the beautiful canopy extends for miles, interspersed by the sacred Ayung River that flows through it. “Sayan Valley has a sacred energy, and you can feel it in the forest symphony of the river, wildlife and gentle breezes,” said Ibu Fera. 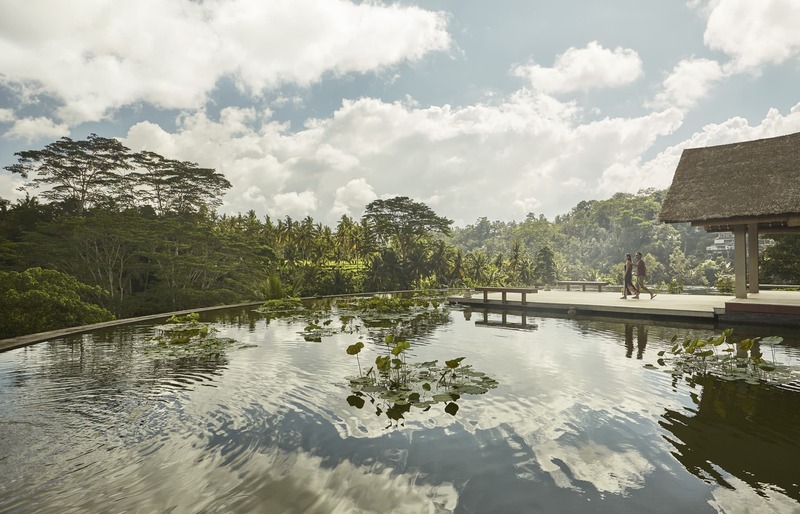 In fact, two days before the sacred nap with Ibu Fera, we were introduced to the valley as we walked in from a dramatic suspension bridge that floats above treetops to the iconic lotus pond of Four Seasons Resort Bali at Sayan. We’ve seen the lotus pond being photographed numerous times, yet experiencing it for ourselves felt surreal. If there’s one Four Seasons property in the world you should visit at least once in your life, this is it — especially since the resort was recognised as the best hotel in the world by Travel & Leisure last year. 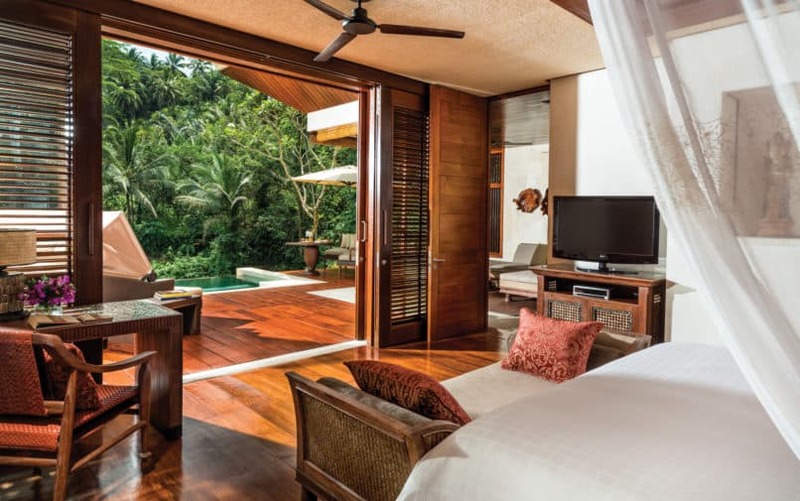 Scattered around its sprawling grounds are 60 suites and villas ranging across few categories, from the river view two-bedroom villas to the one-bedroom duplex suites. Our sanctuary is the beautiful one-bedroom villa, one of the resort’s most popular room category. The light-filled space has interiors that seamlessly blend contemporary and Balinese decor, boasting intricately carved wood, locally sourced shells, and traditional ikat fabric which complement the surrounding greenery and rice terraces. Its spacious with a king-sized bed, separate bathroom area, separate outdoor shower, a walk-in wardrobe, and a plunge pool, all flanked by a private garden that ensures complete privacy. So elegant and timeless our room was, that it’s hard to believe that the resort is twenty years old. The allure of the property, however, besides the beautiful architecture and incredible service, is its location on the Ayung River. This is thoughtfully reflected in the activities at the resort, which enable guests to fully delve into the Balinese way of life. Guests can choose to help local farmers plant rice, visit local villages and hidden water temples off-the-beaten-track, or water raft down the Ayung River while marvelling at the virgin jungles, rice terraces and towering trees of the majestic gorge before landing right in front of the Riverside Cafe, just in time for a sumptuous lunch. One of the resorts’ two restaurants, the Riverside Cafe serves Western cuisine, with highlights such as the Ayung River Pappadelle (king prawns, tomato, white wine, chilli and garlic) or a poke bowl from its wellness-focused menu. Alternatively, guests at the property can also dine at the Ayung Terrace, which serves authentic Indonesian fare whilst boasting a birds’ eye view of the surrounding canopies and Ayung River gushing below. Everything about the resort pays tribute to its unique locale. The spa treatments, for example, draw on the water’s energy and ancient Balinese healing rituals. They combine ancient traditions with physical therapies and energy healing to restore balance and harmony to your body’s key energy centres. Exhausted from travelling, we tried out the Muladhara Chakra Ceremony. The ceremony focuses on the “grounding chakra”, which makes up the foundation of our emotions and actions. Traditionally, the Balinese cleanse the root chakra twice a month to release negativity, bring good health and inner peace, and free their full potential. Our therapist combined a cleansing Balinese kemenyan smoke ceremony with smoothing singing bowls and deep slow massage using locally grown ginger and cinnamon with vetivert, patchouli and jatamansi oils. The treatment induced a deep sense of stillness and connection, leaving us feeling physically and emotionally grounded for the whole day. 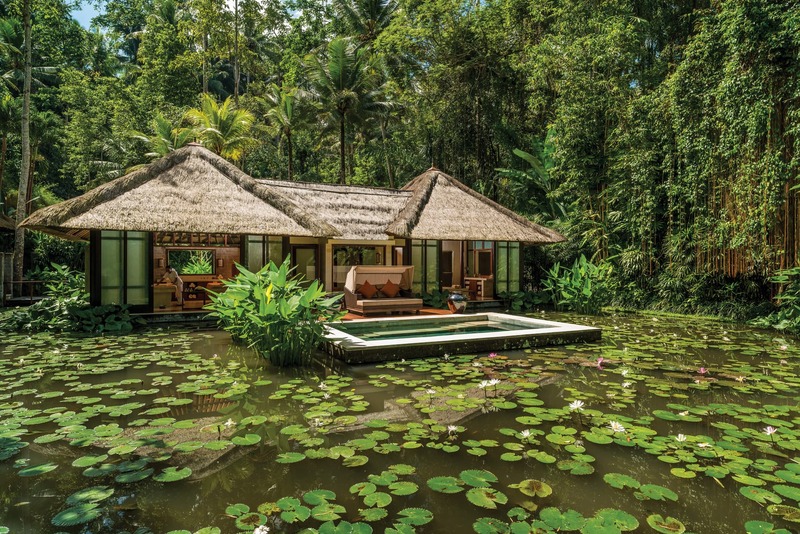 The atmosphere of the beautiful spa villa, which opens out to a stunning lotus pond, was unlike anything we’ve experienced before. If you’re planning a trip to Ubud, June to September boasts the best weather; sunny and warm during the day, and marked by clear and cool evenings. However, that period is also when Ubud is the most crowded, as it coincides with summer holidays in Europe and North America. Avoid the crowds while still enjoying good weather by going in September, when the climate is cool and dry. Many airline carriers, such as Singapore Airlines, Garuda Indonesia and KLM, fly from Changi Airport to Ngurah Rai International Airport. After which, take a transfer to Ubud, a 2-hour drive away.